AFTER I embarked on my research for the Hitler biography Hitler's War, in the mid 1960s, I invested a lot of time and effort in tracking down the surviving high ranking officers and their families. It became evident, as I read the Nuremberg interrogation reports on Field Marshal Erhard Milch, that he had kept voluminous diaries. I visited him in 1967 in his Düsseldorf apartment, where he lived with his niece, and he showed me a suitcase full of the diaries. He explained however that he was retaining them strictly for the use of whoever would write his biography. I volunteered at once, and thus came into possession of the diaries. I spent two or three years on this little detour, meticulously cataloging his papers and diaries, and committing them to 35mm microfilm with his permission. I provided the films and catalogues to the German military archives (Bundesarchiv). I also transcribed the more significant entries from these diaries from the 1920s right through to the 1950s, this being my first introduction to Old German handwriting (my microfilm DJ-59 has the transcripts). From time to time in 1967, 1968, and 1969 I went back to Düsseldorf and interviewed him on the basis on these diaries; I reeled out of his apartment each evening, my head swimming from the choking cigars that he smoked throughout our interviews. The tape recordings are still preserved, and the tapes were all transcribed verbatim at the time by my secretary Jutta Thomas née Padel (she turned out to be the daughter in law of Generalmajor Georg Thomas of the OKW's Wehrwirtschafts- und Rüstungstab, but she kept that from me for twenty years). The transcripts are in my collection, the Sammlung Irving, at the Institut für Zeitgeschichte. In 1967 I had met my publisher William Kimber's US agent, Max Becker, and he persuaded me to take a literary agent, namely himself. Very soon he telephoned me from New York with the welcome news that the book had been bought for $35,000 by Little, Brown, Inc. in Boston, and then by Bild am Sonntag and the Ullstein publishing house in Germany. The research was not without incident. Alerted by comments in Milch's Nuremberg diaries, in 1969 I went to the National Archives to compare the sound recordings of the Nuremberg trial testimony with what appeared in the famous blue volumes of the Trials. There were such shocking discrepancies and obvious manipulations that I decided never again to trust the IMT volumes as a source, and I recommended others not to. In November 2000 the National Archives revealed in a press release that Robert Kempner, Milch's persecutor at Nuremberg (right), had asked the FBI to have me watched in case I destroyed the IMT recordings. THE German edition is slightly different from the British/American; the latter carries more of the postwar story of Milch's career, and of his 1947 trial at Nuremberg which ended with a life sentence; he served about ten years in Landsberg prison. But the German edition of course has the original language of the quotations from his documents (which included about seventy volumes of verbatim records of his German Air Ministry conferences 1942-1944. These volumes I also roughly catalogued and indexed for other researchers: my index is in the Institut für Zeitgeschichte). When the book was ready to be published in London (by my friend George Weidenfeld), I invited Milch over to the city for his first visit since 1935, before the war (he had dined then on one occasion with Mr Churchill.). I put him up at a suitable suite at the Grosvenor House hotel in Mayfair. BBC Television News filmed him visiting the Imperial War Museum, where he saw once again the V1 flying bomb (a cheap and cost-effective 1944-45 Nazi cruise missile) which he had championed against Albert Speer's expensive and extravagant A4 (V2) rocket missile program. Publication of the book in Germany was marked by a lavish luncheon paid for by Ullstein's at the Hotel Breidenbacher Hof in Düsseldorf. My German publisher Wolf Jobst Siedler was there -- as were Milch's friends Nicolaus von Below (Hitler's airforce adjutant) and his wife Maria von Below, and Albert Speer and his wife too. Two minor incidents from the luncheon stick in my memory. My wife asked Mr Speer if she could film him together with myself and his old Dutzfreund Erhard Milch (we had a 16mm film camera). Speer, embarrassed, said he had no objection to being filmed with me, but he would rather that his old friend Milch was not included in the picture (at that time Speer, freshly released from Spandau, had still not given up his hopes of rehabilitation and a major Cabinet post in Germany). It was on this occasion that Maria von Below, sitting next to me at the banquet table, related to me the vivid descriptions of Hitler's last tour of the Berghof, on the evening of July 15, 1944, accompanied by herself and Anni Brandt, the wife of his personal surgeon (whom the Americans would later hang at Landsberg); the Führer had formally taken leave of each of his favorite oil paintings at the villa -- he knew, she said, that he would never be returning. The scene is in my Hitler's War. Surprisingly, it also figures however in Joachim Fest's Hitler biography, which appeared a few months ahead of mine, credited by Fest to an "interview with Maria von Below." She phoned me, puzzled, as she had never given Fest any interviews -- all of Hitler's staff were very close-knit, and they spoke with nobody but me at that time. I explained to her that Fest was the gentleman who had sat opposite us at the luncheon; he had eavesdropped on her conversation with me, and he had got it into print first. MY book was published just after Erhard Milch died. He had read it however, and he liked the biography, though it was less flattering than he had hoped. At one stage I described him as being James Cagney to Albert Speer's Henry Fonda. Puzzled, he tapped the manuscript with his cigar and asked who these two men were, Fonda and Cagney. "Fonda," I explained, "was the suave, westernized, educated, academic. Cagney was the stocky little guy who burst into rooms spraying people with a round-drum Tommy gun." "Couldn't I be the Henry Fonda one?" he said, wistfully. Alas for the subject of many a biographer, you are what you are. 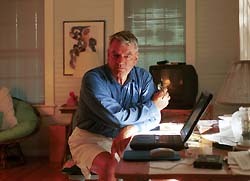 David Irving is the author of The Trail of the Fox, The Destruction of Dresden, and other works of contemporary history. IRVING brings Milch to the centre of the stage as a ruthless, imaginative patriot, narrow but not without humour; a man who caused Britain grievous injury, fought as soldierly a war as most, and refrained from crying "Peccavi!" in captivity. As Irving implies, the Field Marshal could hardly complain about humiliations in defeat since he had been happy to accept applause in the day of the triumph. There was an element of natural justice about the ten years Milch served as a war criminal even if his trial showed that some Allied judges at Nuremberg -- warriors who fought with shuffling papers -- were appreciative students of the Nazi Peoples Courts.